Keller divides his material into three parts. Part One, “Serving the Word,” argues that preachers should preach the Bible (Chapter 1), which means preaching the gospel (Chapter 2), which means preaching Jesus Christ (Chapter 3), about whom all Scripture is written (Luke 24:27). Keller recognizes that there are times when preachers should deliver topical sermons, but their bread-and-butter sermons should be expositional. Because Scripture tells the unified story of what God has done in Christ through the Spirit to accomplish our salvation, sermons should be gospel-centered. Two dangers need to be avoided: (1) “preaching a text, even about Jesus, without really preaching the gospel,” which is typical of moralistic preaching; and (2) “preaching ‘Christ’ without really preaching the text,” which is typical of proof-texting. To help avoid these dangers, Keller outlines six ways to preach Jesus from all of Scripture that are adequate to both the gospel and the context of a particular passage. Part Two, “Reaching the People,” opens with the recognition that preachers must contextualize their messages to their audiences (Chapter 4). Such contextualization has biblical precedent. For example, compare and contrast how Paul preached to Jews meeting in a synagogue (Acts 13:14–47) with how he preached to Gentiles meeting on Mars Hill (17:22–31). Contextualized preaching consists of a two-fold movement whereby sermons “adapt to the culture” as well as “confront the culture.” Because God created the world and humanity in his image, he has left traces of himself in all cultures. This makes adaptation possible. But humanity has sinned against God and distorted the goodness of his creation at all levels—individual and social, intellectual and emotional, spiritual and material. This makes confrontation necessary. Part Three, “In Demonstration of the Spirit and of Power” consists of a single chapter about the character of preachers themselves. 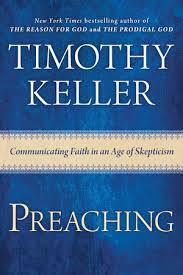 Keller writes, “your listeners will be convinced by your message only if they are convinced by you as a person.” Preaching, he goes on to say, thus deals with “text” (Bible-gospel-Christ), “context” (culture-heart), and “subtext” (what really motivates the preacher). Though Keller does not point this out himself, these three terms more or less correspond to the threefold division of classical rhetoric: logos (text), pathos (context), and ethos (subtext). Though I found Preaching to be a helpful work, which was especially insightful on late modernity’s “baseline cultural narratives,” I nonetheless found myself asking a few questions. First, and this is impressionistic, I felt that some of Keller’s examples of how to preach Christ from all of Scripture were not adequate to the text’s context. For example, discussing the horrifying story of the Levite and his concubine (Lev. 19), Keller suggests the following as one of many possible ways to preach Christ from the passage: “When we see a man who sacrifices his wife to save his own skin—a bad husband—how can we not think of a man who sacrificed himself to save his spouse—the true husband?” I see Keller’s point, but is that really a way to find Christ in the text? Here’s what we must do. Why we can’t do it. How through faith in Jesus you should live now. Third, Keller’s conversation partners throughout the book are almost exclusively Calvinist. He does mention Protestant mainline preachers, but not evangelical Arminians, Methodists, or Wesleyan-Holiness preachers. (I’m an Arminian Pentecostal.) Given that these non-Calvinist evangelicals have produced quite a few well-known preachers, I can’t help but wonder whether they might have insights to share as well. In spite of these questions, Preaching is a valuable work by a respected pastor whose judgment on such matters is always worth listening to. I get the feeling I’ll be returning to this book again (and again).